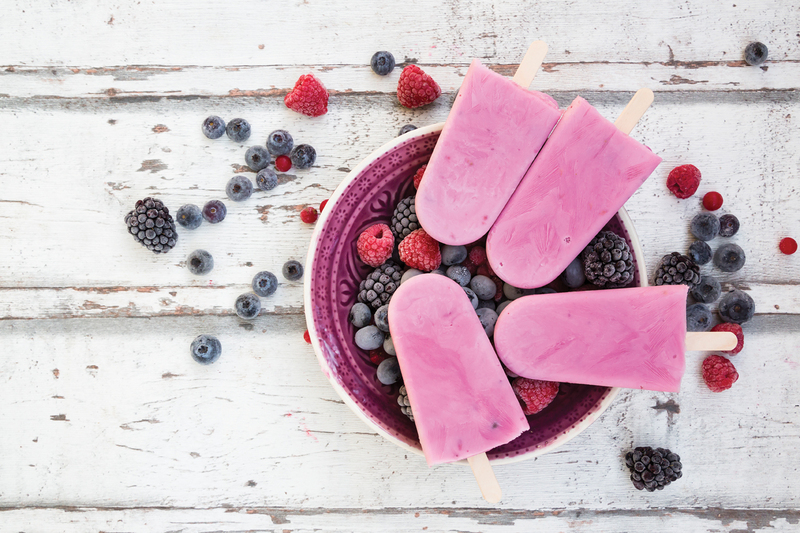 These nutritious fruit-filled ice lollies will have the entire family heading to the freezer. Using fresh fruit and a hint of honey, these delicious ice treats are free of refined sugar and hidden nasties. 1) Mash the blackberries and the honey together until smooth. 2) Stir in the yoghurt, mixing well. 3) Pour the mixture into your lolly mould with sticks and freeze. 1) Blitz the pomegranate seeds in a blender. 2) Add the watermelon, honey and lemon juice and pulse until mixed. 3) Strain the mixture through a sieve. Taste and add more honey or lemon as required. 4) Pour the mixture into lolly moulds, add a stick and freeze. Tip: For a tangy flavour, add a few mint leaves at stage two. 1) Mix everything in a blender. 2) Add the blueberries and pulse until smooth, with some lumps of blueberry. 3) Pour into your lolly moulds, add sticks and freeze.